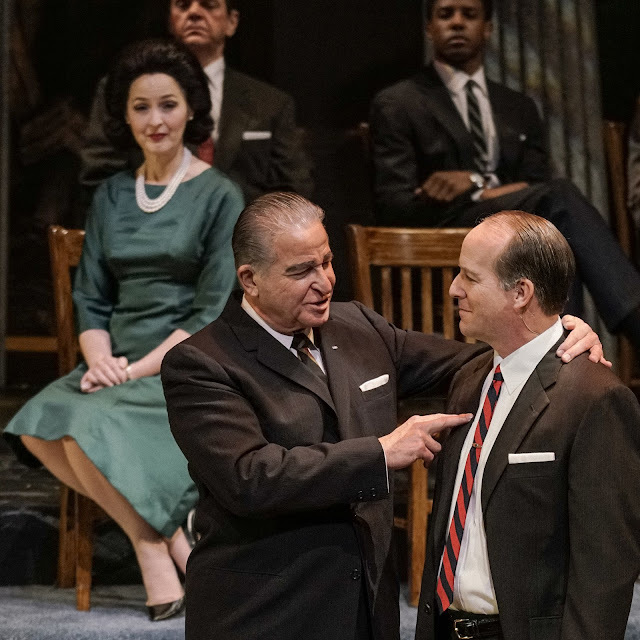 Photograph from "The Great Society" at Zach Theatre. I thought packing for photography shoots was painful but packing for video and photography shoots mixed together is....well....more painful. One issue is with the way I use LED light when doing lighting designs for video (and stills now...) I use diffusion on frames to modify the light from the fixtures. I like this because I can control the character of the light by moving the light closer or further away from the diffusion, and I can add more control by moving the diffusion closer or further to the subject. But! It requires two light stands instead of the one light stand I could get away with if I was using something self-contained, like a soft box. As I delve deeper and deeper into the practice of recording sound on location I'm learning that different sonic environments require different microphones. A room with carpeting and lots of padded furniture and drapes is a location in which shotgun microphones can be used with good results, but a room that big and bright and echo-y might not be as good a match. In that situation a shorter, slightly less narrow pick-up pattern microphone might actually be a better choice. And in areas of utter audio chaos we'd probably want to default to a lavaliere microphone. That means we're bringing all three kinds. I'm pretty adept at using two lights for most situations but I'd never travel out of the studio without a few back up lights so that means we're packing an extra copy of our main light and tossing it the new "mini" LED light as a "last resort" back-up. I packed a smaller tripod last week but I spend a lot of time with my cameras on a tripod and it kept bugging me that I would not have my preferred tool on site so I pulled the smaller tripod out and replaced it with my big, happy, comforting tripod; the one with the leveling ball and the super smooth pan-ability. On my interviews I know I want to set up a stationary "b" camera to shoot my interview subject from a difference viewpoint so I've packed a table top tripod for a second camera. While the main mission of my upcoming assignment is to get good video we'll also need to capture good supporting still images for complementary collateral and campaigns. That means camera and lens inventory is going to be a bit different. On my last shoot I depended mostly on the Sony a6300 and Sony rx10iii and both of them were good, solid choices for video. But I've spoiled this client over the last year by delivering mostly photograph files that originated as uncompressed 42 megapixel raw files from the Sony a7Rii, which is a wonderful and expressive still photography tool. It calls for a slightly different selection of lenses to work the way I like. That adds to the packing. In the end I've settled on three checked bags and one carry-on. One checked bag (a Tenba Tri-Pack) holds the big tripod, a few light stands and a couple of Manfrotto grip heads (one for the boom arm stand and one for the Chimera diffusion frame). The next bag holds the lighting and audio gear, along with audio cables. It's a wheeled (and very sturdy) Tenba air case. The third bag is the catch all. It's got the clothes I'll need, along with an extra pair of shoes, and also holds the diffusion frame and silk, a pop-up reflector, some clamps, the portable monitor (in protective case) and a set of Sennheiser lav microphones (in a tiny Pelican case). I can strap the tripod case to the Tenba air case in a pinch and then I'm just shepherding two cases with wheels and wearing a back pack. The backpack holds the cameras, lenses, memory cards, (way too many) batteries for the cameras, as well as batteries for the monitor. It also contains the script/shot list/meeting notes/contact info and, in a nod to past practices..... a Sekonic incident light meter. In the best of all possible worlds I'd be traveling with a 1990's style entourage and would bring cases and cases of gear to play with. But I wouldn't want most of the people to hang around my sets all day and I certainly couldn't afford to pay them all out of the budgets most clients have these days. No, I think the stuff I've settled on will be just right. Anything else I need I can buy or rent on site. Packing really does seem like a negotiation. You quickly get to the point where, if you want to add something to the mix you absolutely have to dump something out that you've already packed.